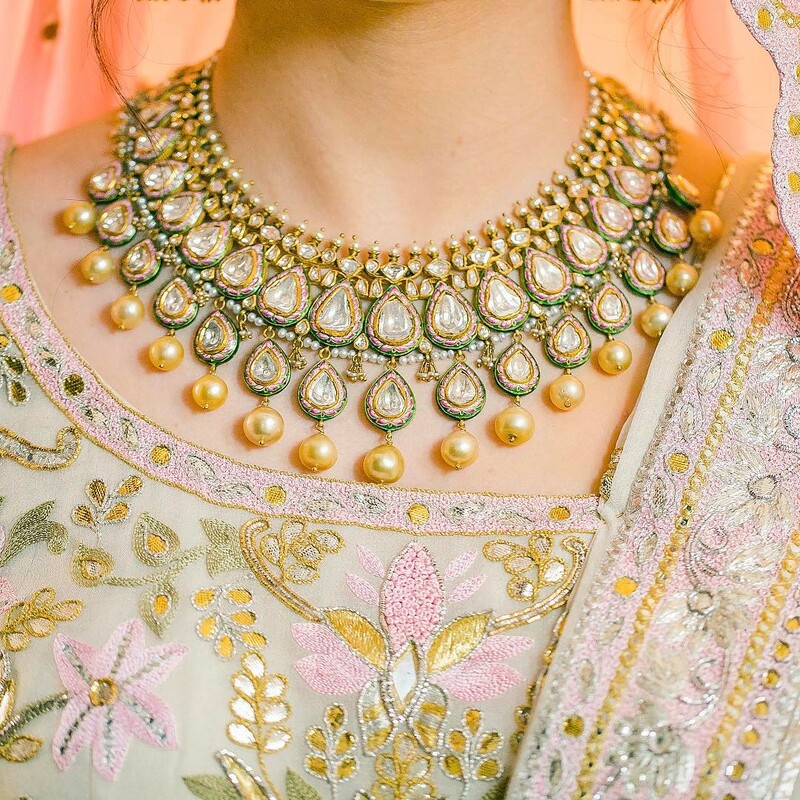 » » The Urban Guide » Weddings » Wedding Jewellery » 9 Popular Bridal Necklace Styles – What They’re Called & How To Style ‘Em! 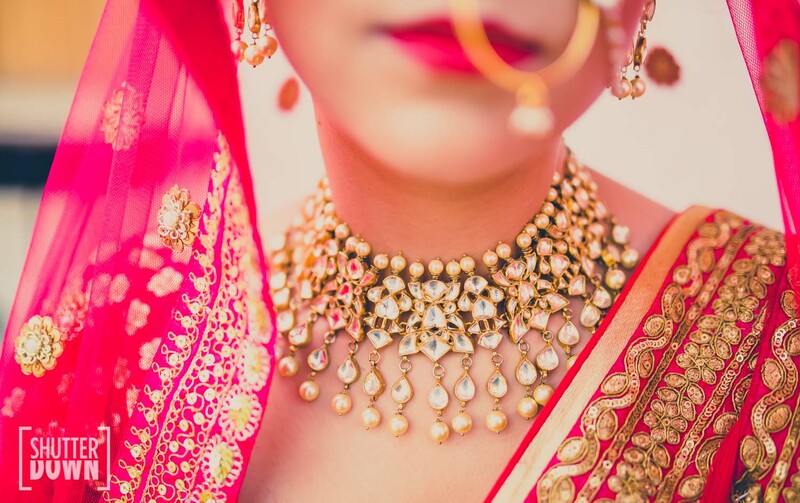 You found a bridal necklace you loved online, and you want to see more of the same style! But wait, what’s this type of necklace called? 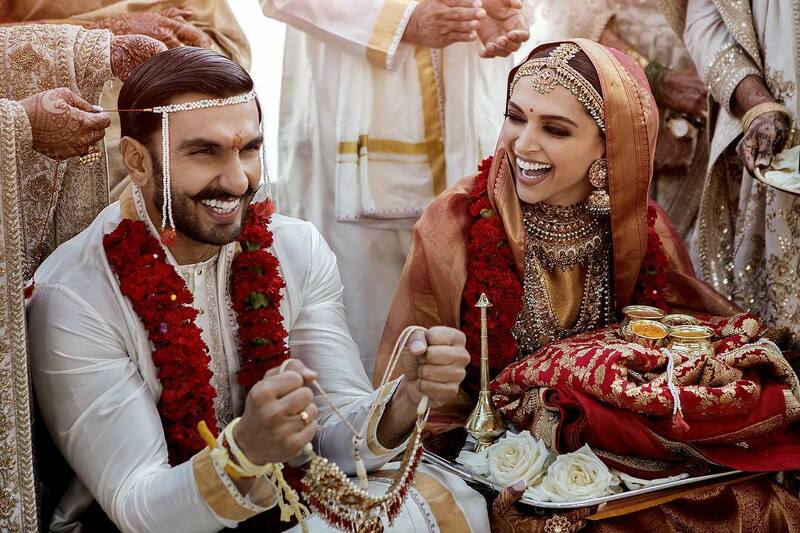 Is it a guttapusalu or a Raani Haar or Satlada? 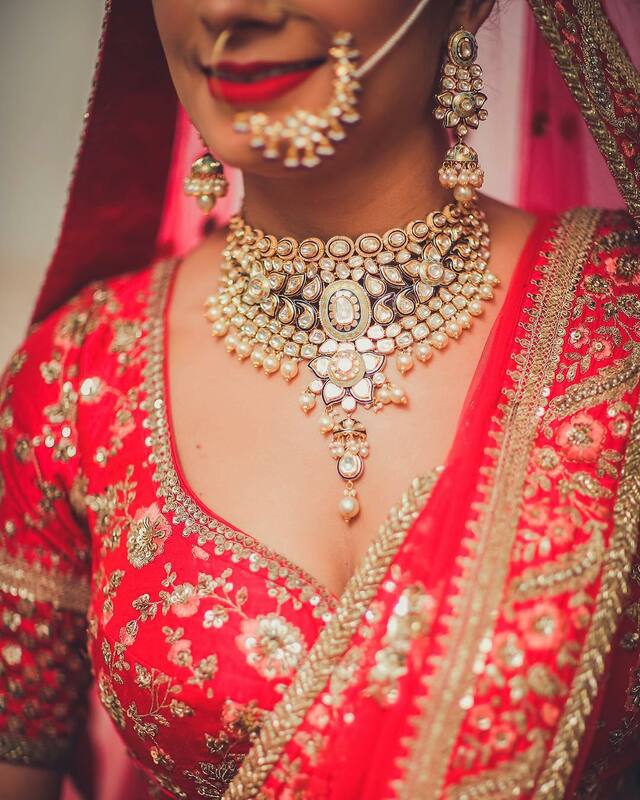 The Indian bride’s Wedding jewellery is, let’s admit it, confusing. 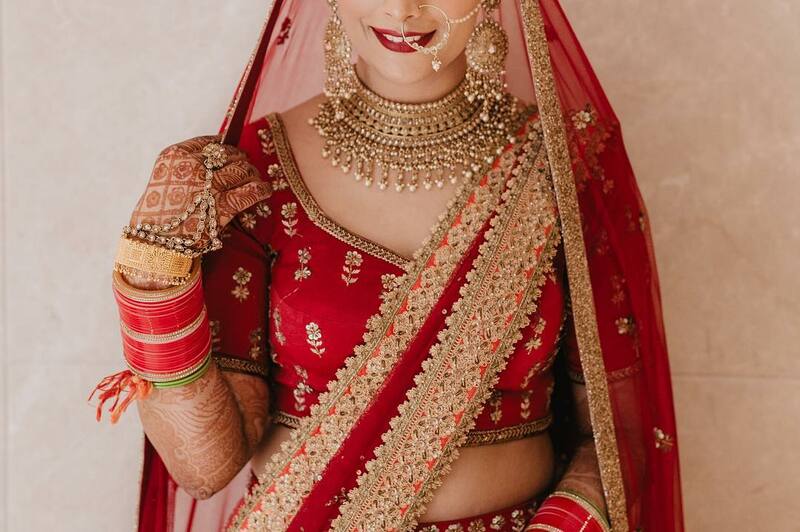 If you’re well-versed with the basic solah shringar, congratulations – you’re one of the few brides who actually know their jewellery basics! 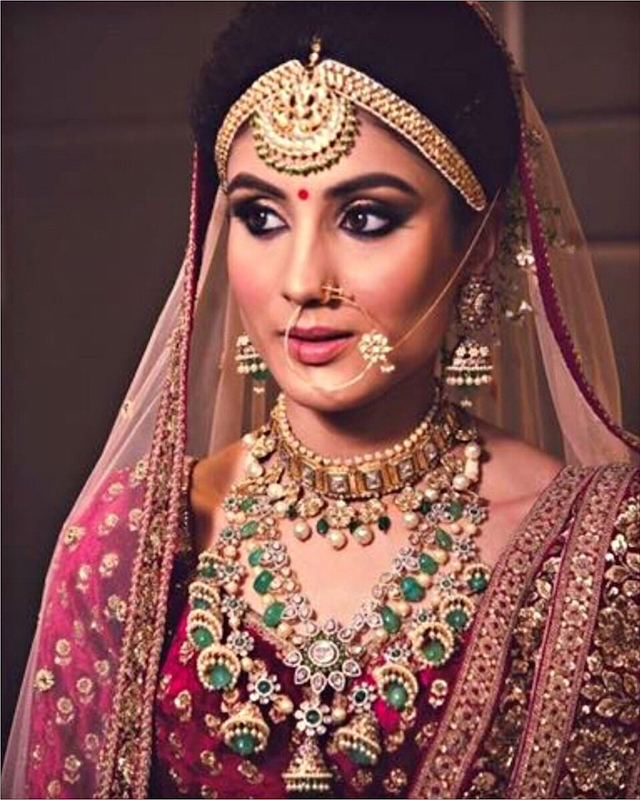 One of the solah shringar is the Haar, the necklace. 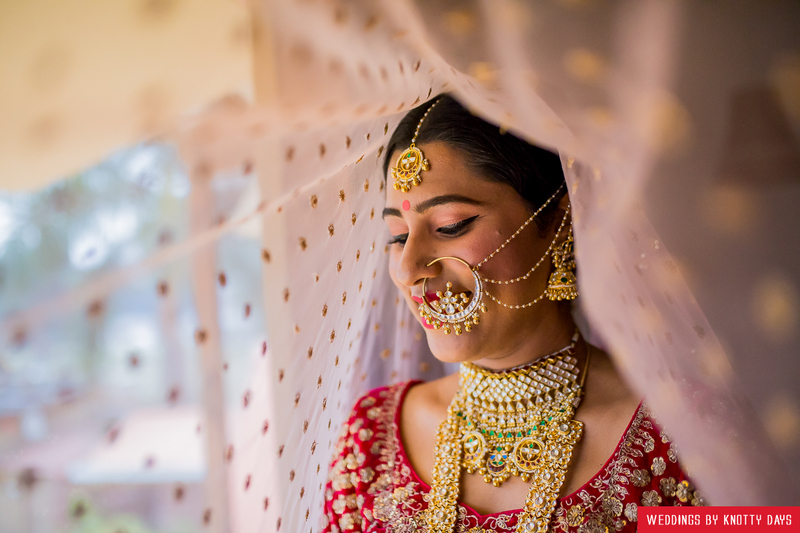 There are probably more than a dozen different types of necklaces, but if you’re getting married this year, there are a few you should definitely know about. 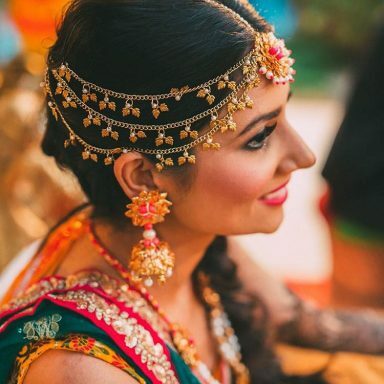 These are 9 of the hottest necklace styles brides are wearing these days – from the guttapusalu that Deepika Padukone & Sonam Kapoor wore to their weddings, the Aadh & Satlada that are coming back into fashion and the Rani Haar & Gulbandh that continue their rule over brides’ jewellery boxes. Don’t worry if you’re finding these terms confusing. 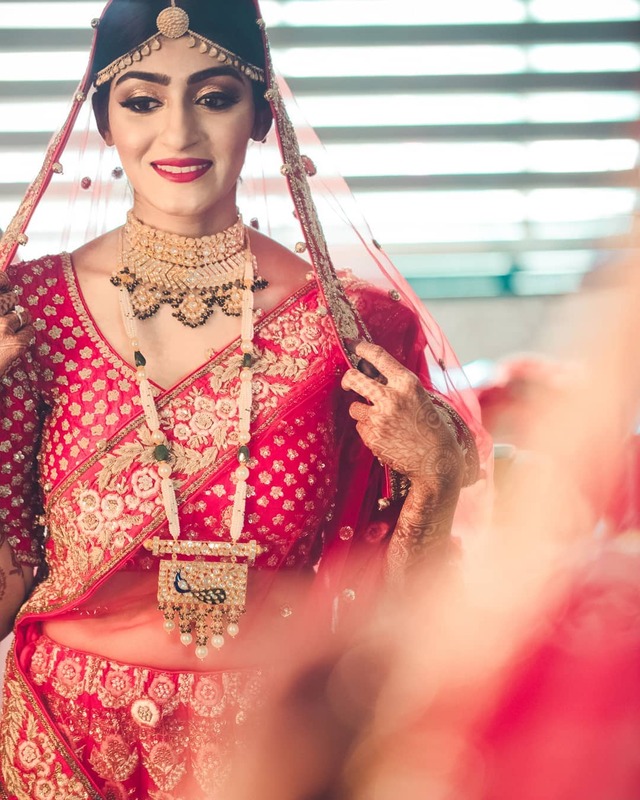 Once you’re through with this article, you’ll know names of all 9 bridal necklace types and you would’ve also seen the popular and most beautiful design options for each of them! The choker has gained popularity in the Western world in the last 2 years. 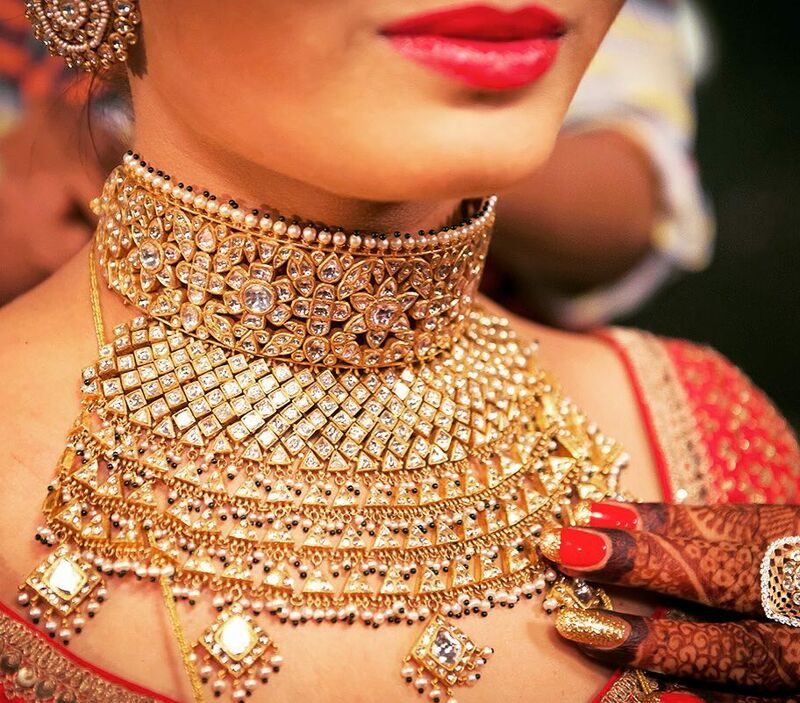 It’s already reached the Indian bride’s trousseau with many brides choosing to go for a choker necklace on their wedding day! Pair it with a low or v-neck neckline, or a strapless blouse. 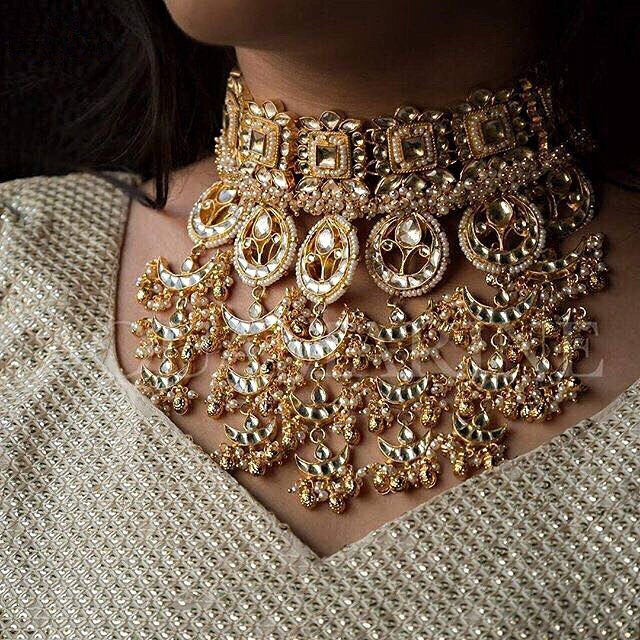 Choker jewellery, especially those with drop designs or when layered with other necklaces, look great with both – lehengas and indo-western gowns. 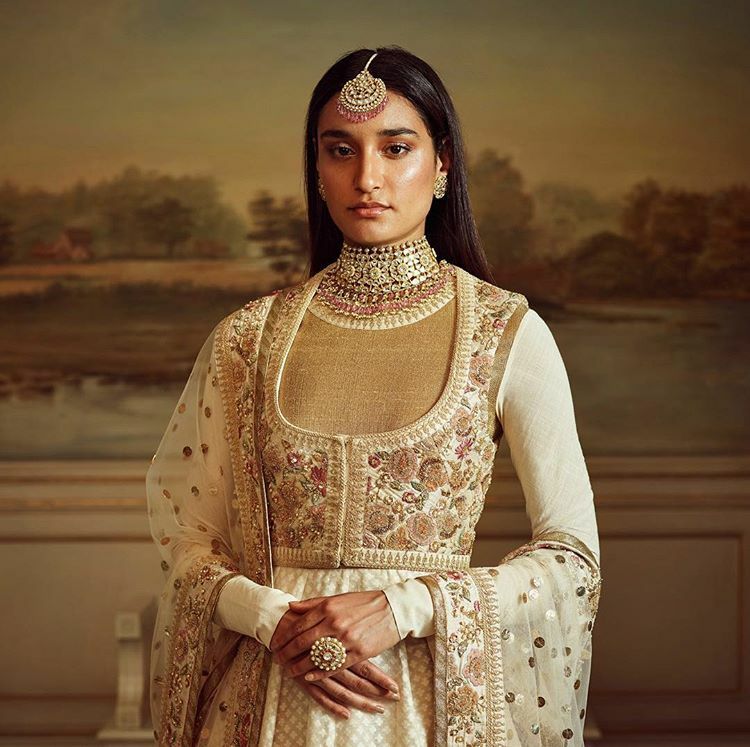 If your blouse or yoke is plain, it makes sense to wear just a rani haar. 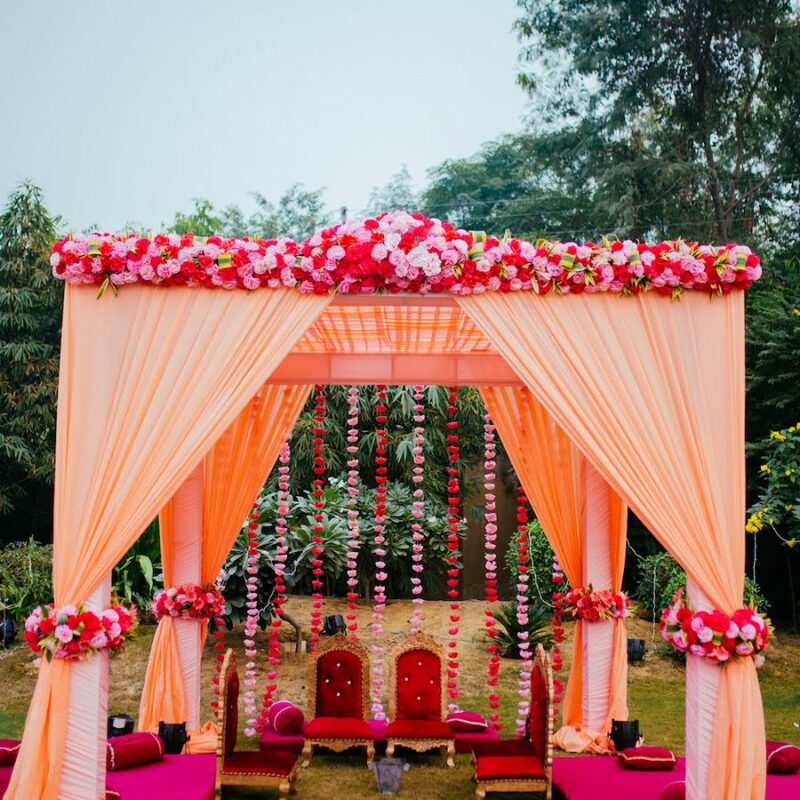 It becomes your statement piece in that case as it stands out against the plain backdrop. Technically, a Satlada could be called a type of Rani Haar. But it’s got a pretty unique look! 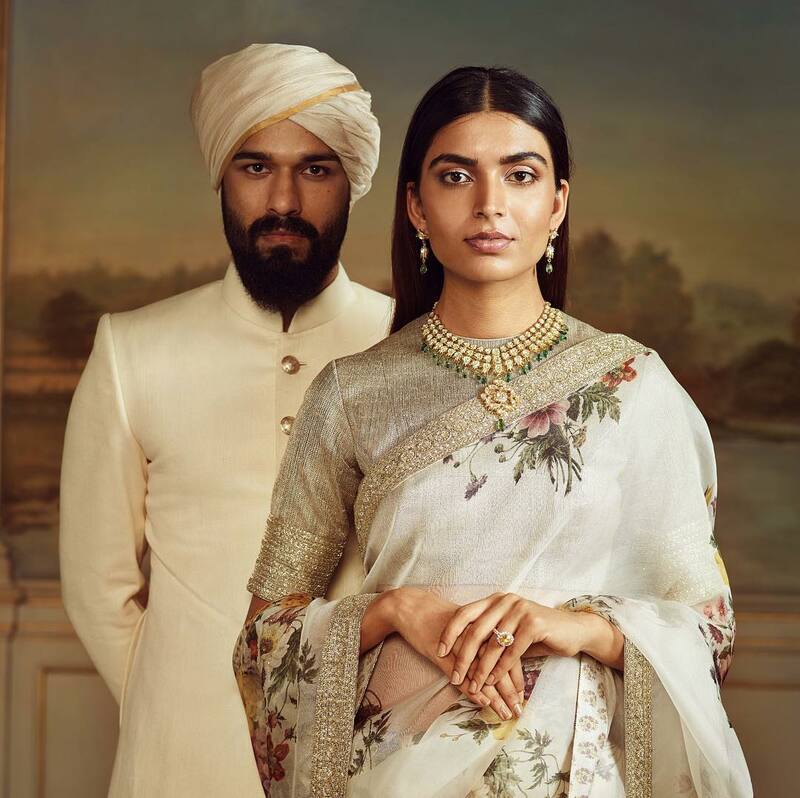 It’s another style that’s become really popular since Sabyasachi started dressing his models in it years back. 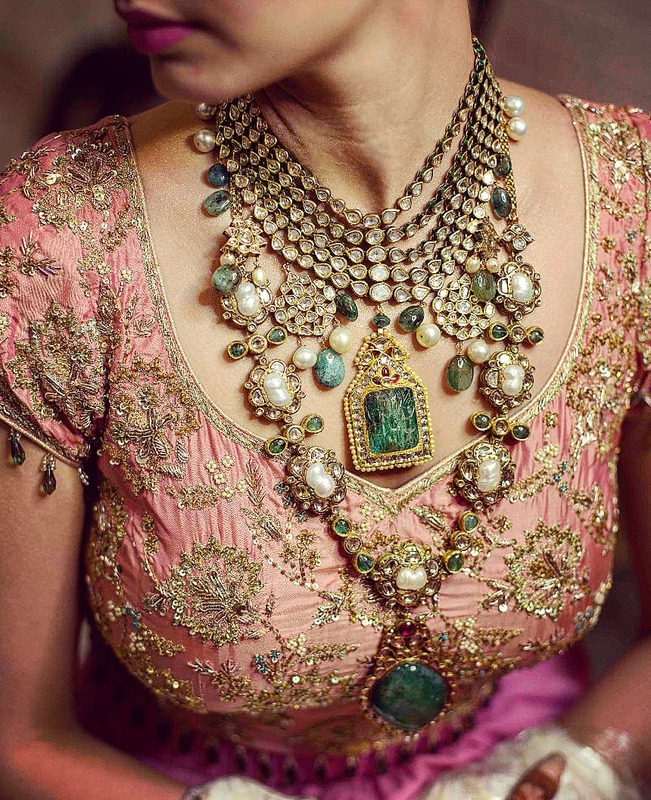 Satlada has seven layers of pearls or gems, woven or attached. 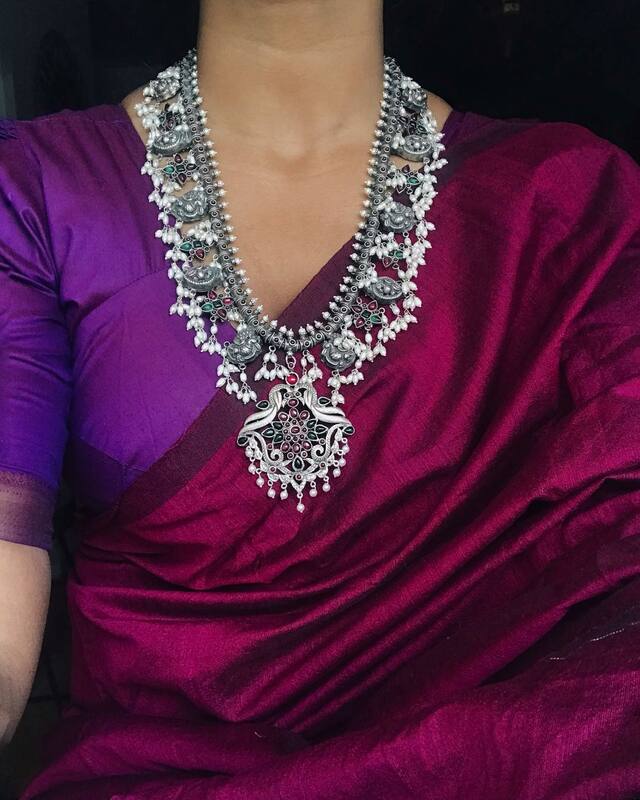 The smaller versions are called Panchlada (5-layered necklace) or teenlada (3-layers). 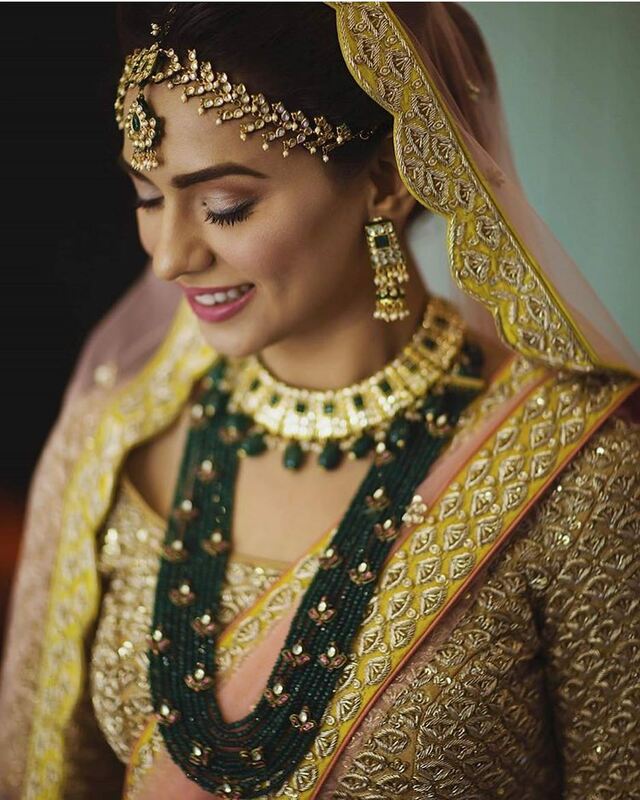 It was made popular by Mira Rajput Kapoor when she wore it on her wedding to Shahid Kapoor. 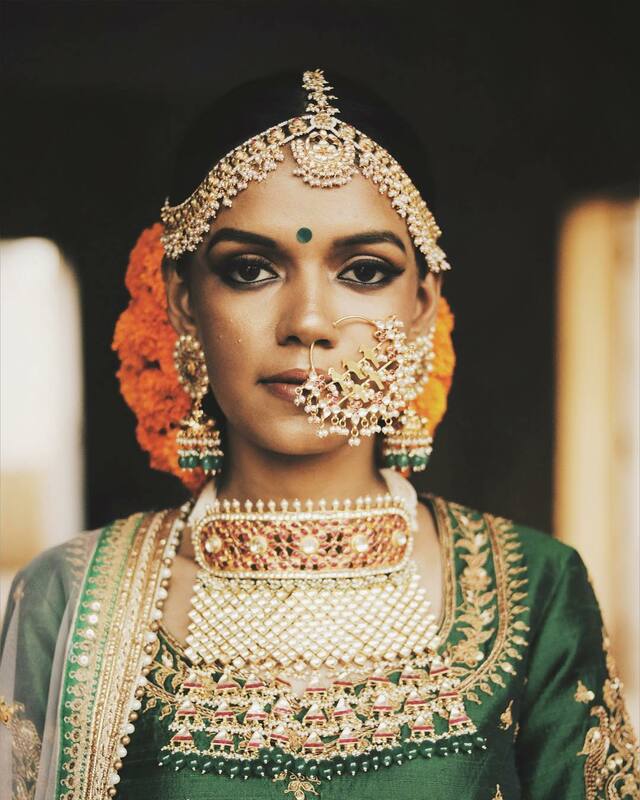 This was followed by Masaba Gupta wearing it to her Sangeet, and since then, we’ve seen Navratan jewellery everywhere! It is a colourful necklace that has nine different precious and semi-precious gems (pearl, emerald, ruby, red coral, yellow sapphire, diamond, blue sapphire, cat’s eye and hessonite). 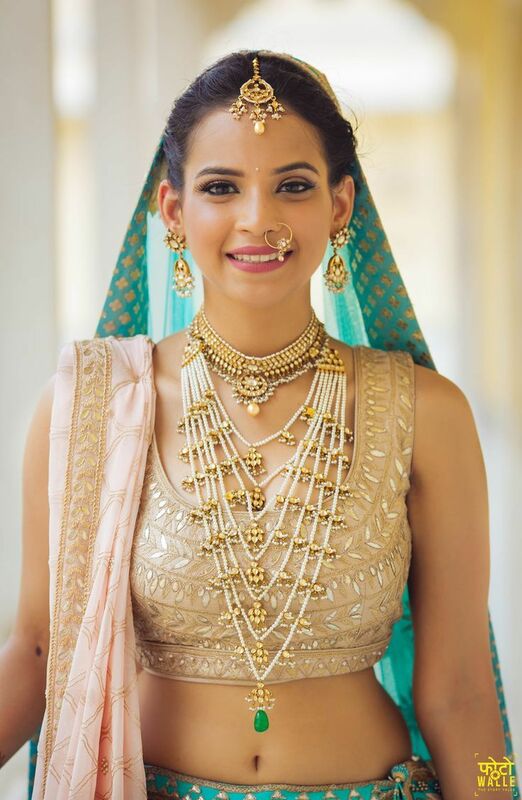 Unique combination of multiple Navratan necklaces! It’s the most basic style of necklaces – sits just below the collarbone and is the most universally flattering length. It’s also called the Princess necklace. 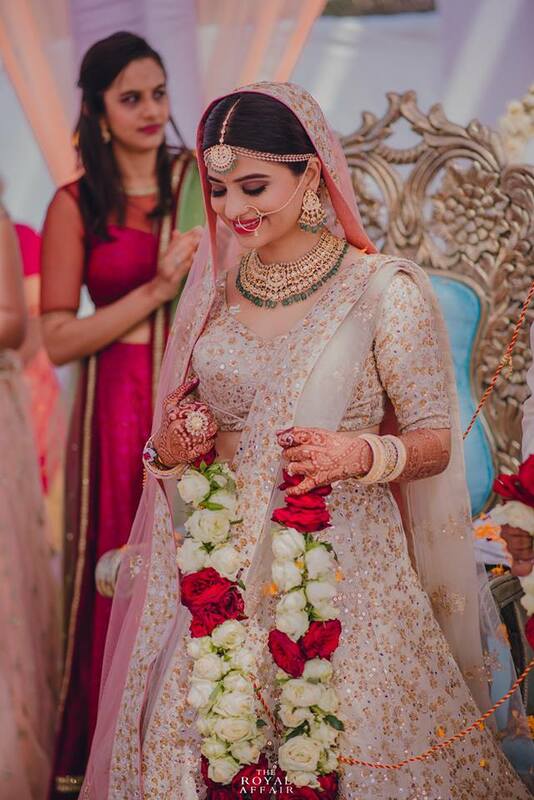 Round or sweetheart necklines work best for Polki & Pearl style of necklace as the lines complement each other, moving focus to the necklace. 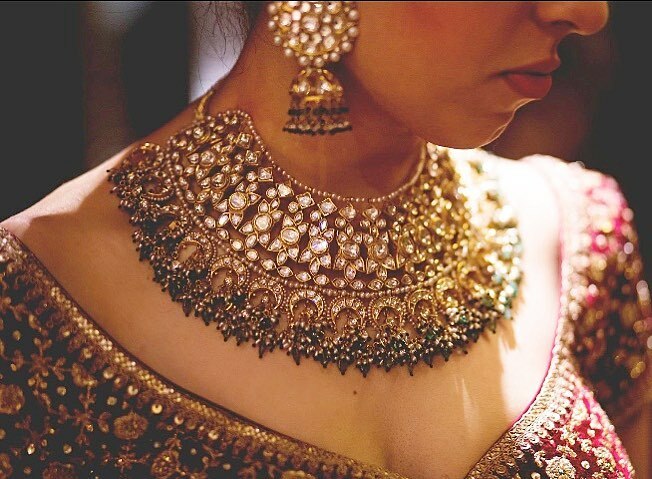 Alternatively, style them by wearing over a close neck blouse, especially if your necklace features precious stones. A bib necklace is basically shaped similar to a baby’s bib. It’s typically large in size. 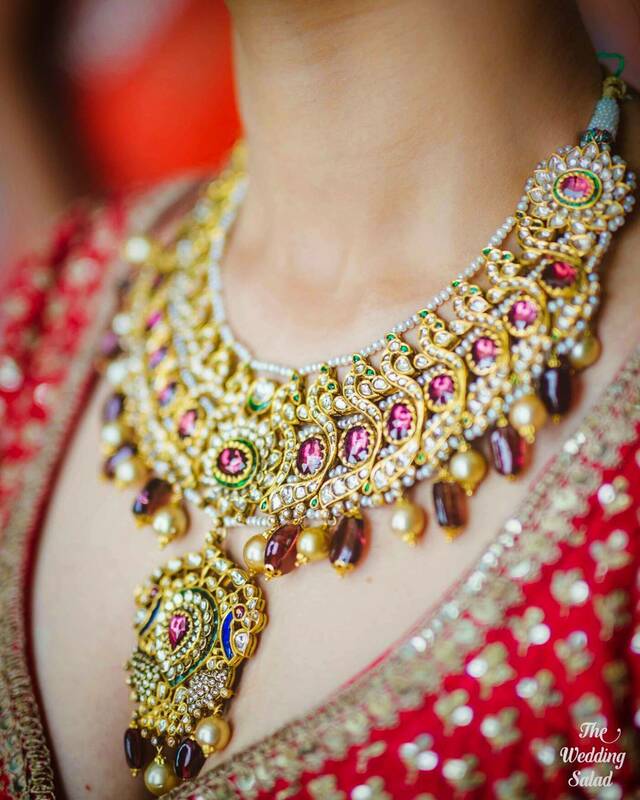 Brides who want to make a statement with their jewellery choose this necklace style. 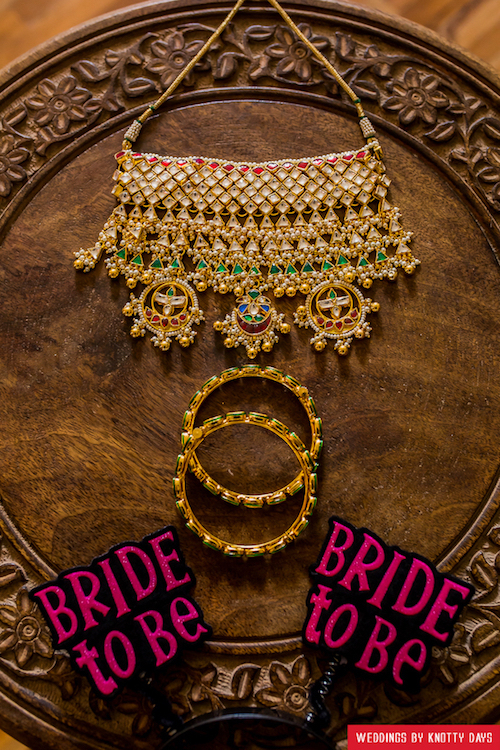 Bib necklaces with crescent hangings are one of the in-demand designs! 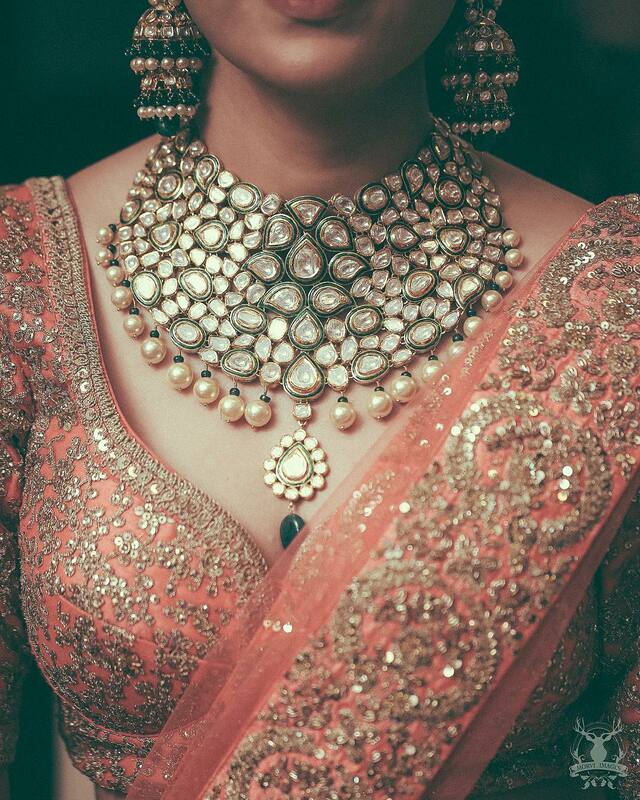 If you have a short neck you may want to avoid bib necklaces or choose styles that fall lower on the chest. 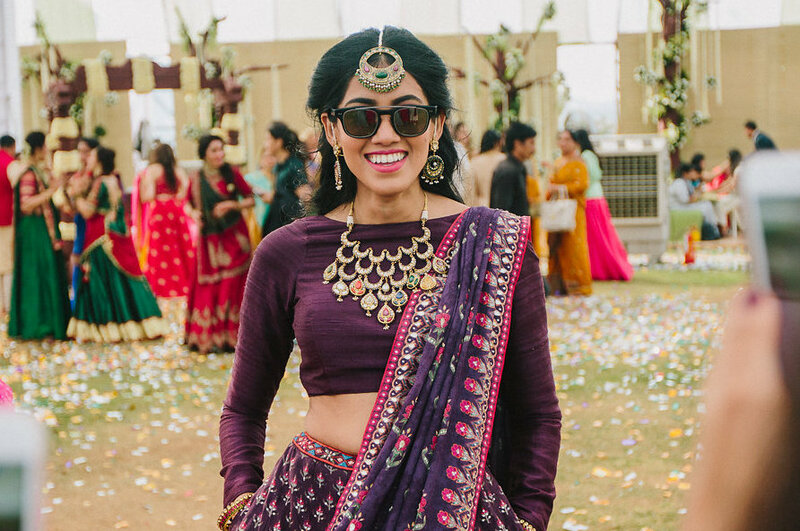 You must avoid big earrings when wearing a bib necklace. 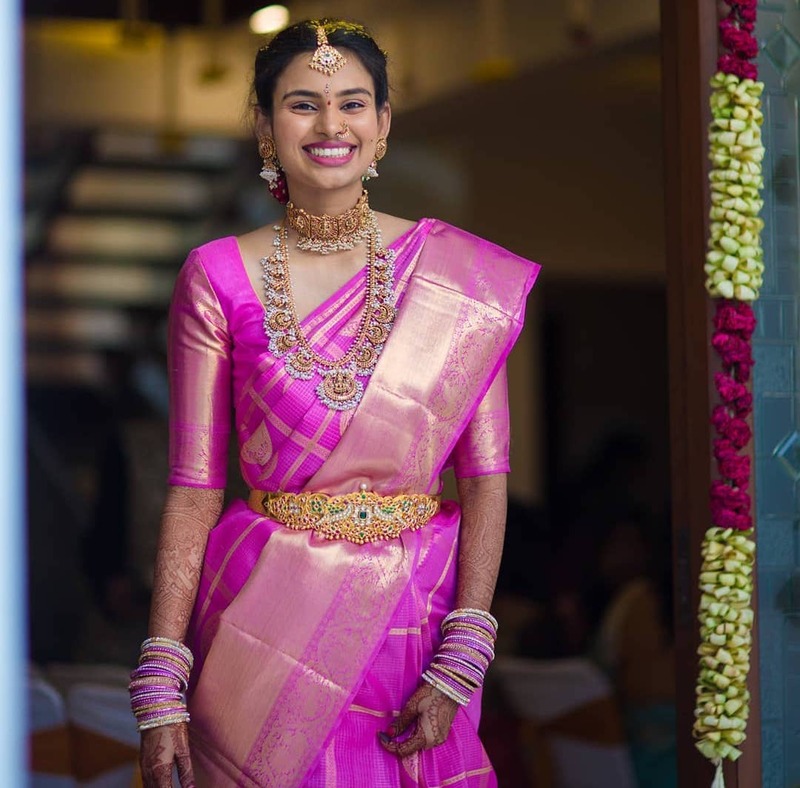 It starts with a choker (typically a block of gold with enamel/Meenakari work at the back) and ends with strings of triangles. 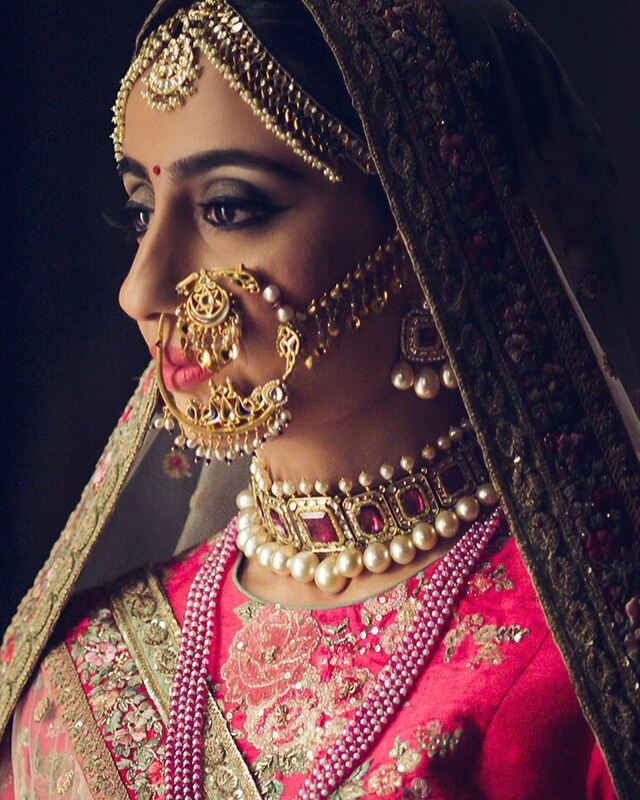 The Aadh is a traditional style, seen on Rajasthani brides, that covers almost the whole neckline area. 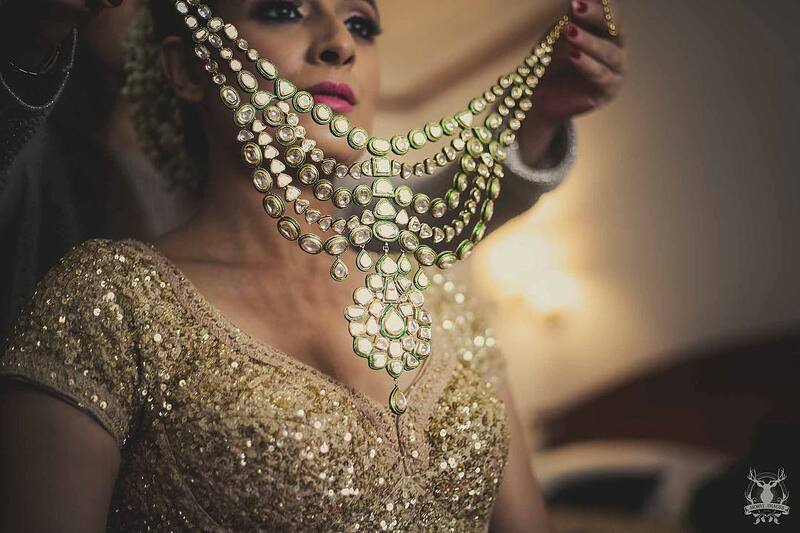 But it’s not only Rajasthani brides who are wearing this Necklace Jewellery now! The Aadh Necklace looks best with a square neckline – you have to keep the neckline low otherwise the look will be too cluttered. 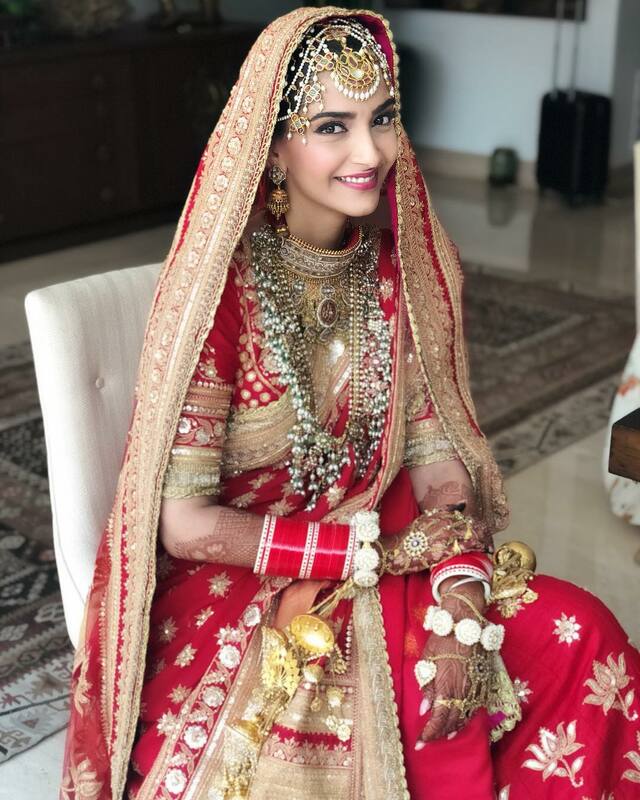 It’s a traditional piece, so it makes sense to keep the other accessories fairly traditional too. 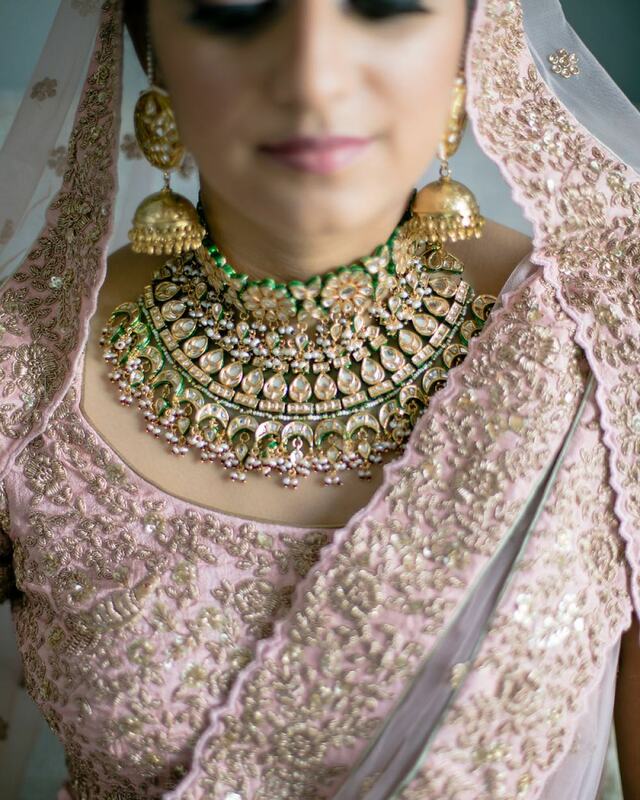 Sweetheart & round necklines look great with it! 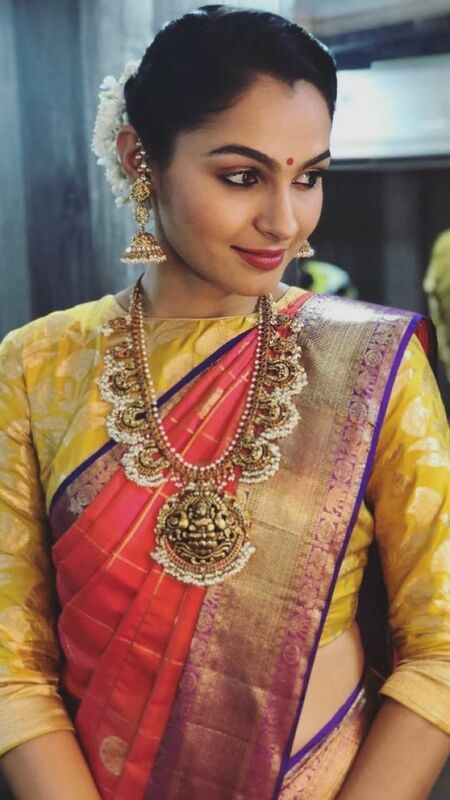 With both Deepika Padukone and Sonam Kapoor layering their wedding day jewellery with guttapusalu necklaces, this South Indian design is guaranteed to get popular again. 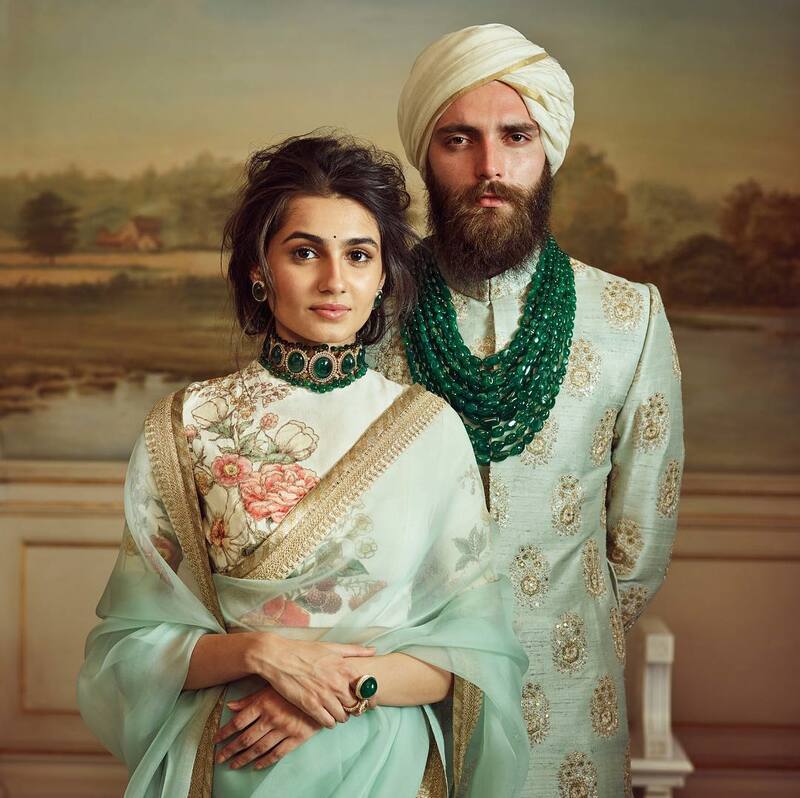 It’s a raani-haar style long necklace made of gold that typically ends with bunches of small pearls at the fringes, with a splattering of diamonds, rubies and emeralds set within it. 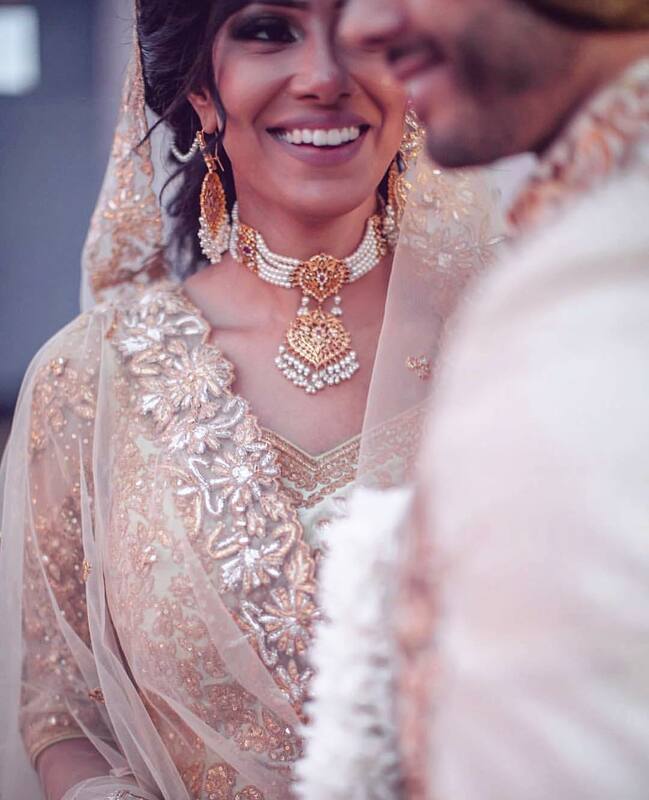 Want to see more Wedding Jewellery ideas? Check them out here! 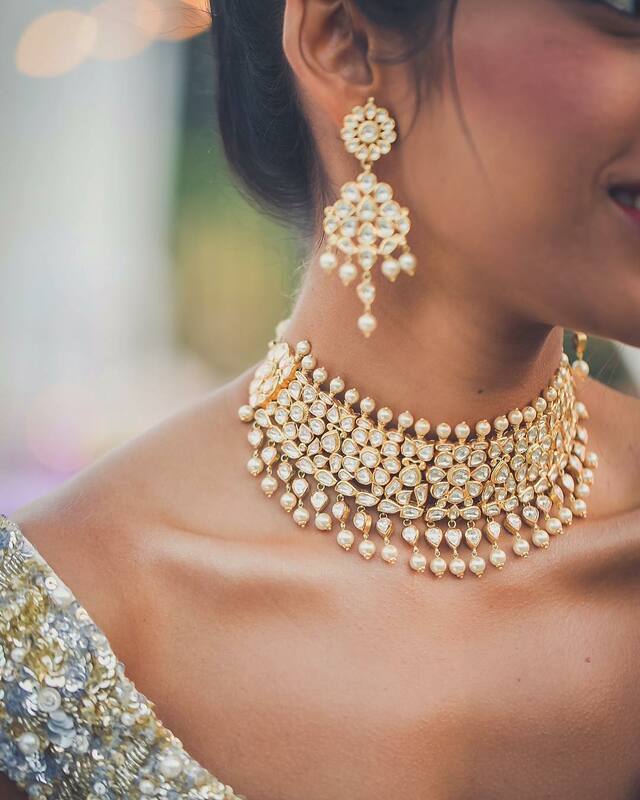 19 Popular Bridal Necklace Styles – What They’re Called & How To Style ‘Em! 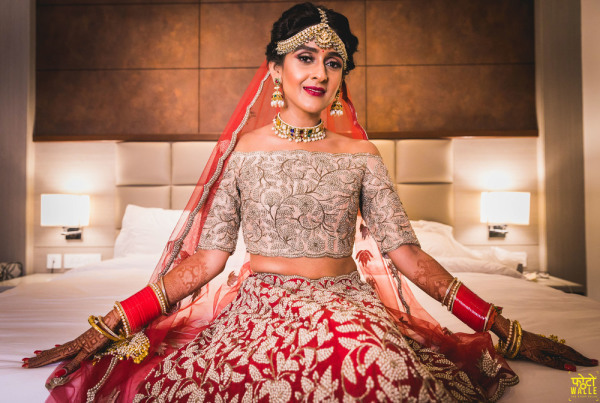 3 Abhinav Mishra’s Newest Collection Is Perfect for The 2018 Bride! 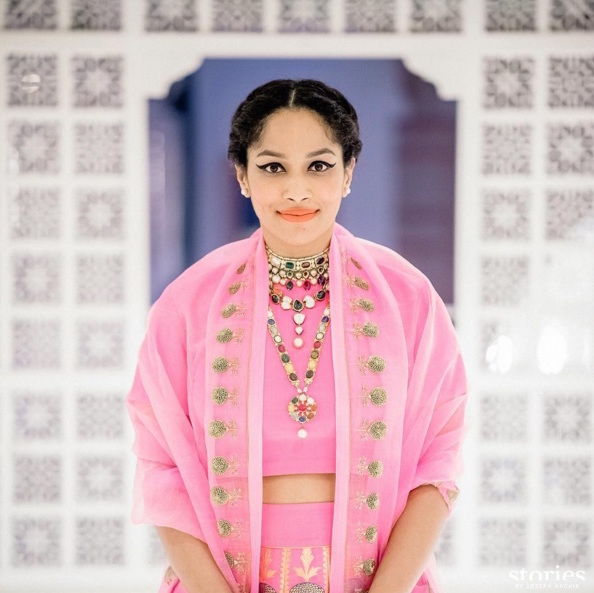 4 22 Ideas To Steal From Mansha’s Pin-Worthy Delhi Wedding!